There’s nothing like biting into a freshly baked lemon poppy seed muffin. The warm, inviting texture is comforting and delicious while the pop of lemon flavor creates a wonderful balance with the buttery base. Next time you’re craving bakery-style lemon muffins, pull out your muffin pan and look no further than this recipe. 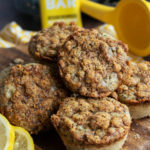 These lemony delights are free of common muffin ingredients like sugar and all-purpose flour and full of keto-friendly alternatives like almond flour, monk fruit, and flax meal. There’s nothing to throw you off track like a sugar craving. Whether you skipped a meal by accident, ate something that got your blood sugar roller-coaster going, or you just feel the need for something sweet — when that sugar craving hits it can feel like a do or die situation. The best way to deal with a sugar craving? Prevent it by eating lots of fiber and foods with nutrients that can help you stave off your sweet tooth. These Lemon Poppy Seed Muffins are a great option when that sugar siren song starts going off in your head. Flax is a fantastic source of fiber, contributing to the 3 grams of dietary fiber in each one of these lemon poppyseed muffins. It has an especially significant amount of soluble fiber, a type of fiber that may increase satiety and help control appetite[*]. One study found that, compared to a control, adding 25 grams of flax to a meal significantly reduced appetite and decreased energy intake[*]. Another ingredient that may help control appetite are the MCTs (medium chain triglycerides) in Perfect Keto Lemon Poppy Seed Bars. MCTs have been found to increase your feeling of satisfaction, as well as decrease overall food intake[*]. Heart disease is the leading cause of death in the United States, and worldwide[*]. A huge factor in keeping your heart healthy and pumping is diet and nutrition. Antioxidants like vitamin E, are known to support heart health and may protect against heart disease[*]. This recipe is loaded with vitamin E coming from the almond flour and the almond butter in the Perfect Keto Lemon Poppy Seed Bar. One study of around 90,000 nurses found that incidences of heart disease were 30-40% lower in those with the highest intakes of vitamin E[*]. Another heart health-promoting ingredient is flax seed. Flax has been shown to decrease blood pressure as well as balance cholesterol levels[*][*]. In one year-long randomized controlled trial, people consuming flax seed daily were found to have significant reductions in blood pressure[*]. In another trial with people already on blood pressure medication, flax intake was found to lower blood pressure even further and decreased the number of people with uncontrolled high blood pressure[*]. There is a myriad of nutrients that go into creating optimal brain function, and this recipe happens to be packed with quite a few. The vitamin E from almonds may do more than just protect your heart; there’s good reason to believe that this antioxidant vitamin plays a role in brain function as well. In a clinical trial of over 300 people, Alzheimer’s patients were given either vitamin E, a combination of vitamin E and an Alzheimer’s drug, or the Alzheimer’s drug on its own. The trial took place over two years and assessed the brain health of the patients to determine if there was a positive effect of supplementing with vitamin E. Researchers found that enhanced vitamin E intake significantly delayed functional deterioration of the brain and the need for institutionalization of the patients[*]. Another brain health-promoting nutrient you’ll find in these muffins is choline. Choline is an essential part of normal growth and development of your brain, and eggs are a great source of this compound. Choline is a precursor to an essential neurotransmitter that your brain releases called acetylcholine. Acetylcholine works throughout your nervous system acting as a messenger and sending signals to other parts of your body[*]. Higher intakes of choline have been positively correlated with better cognitive performance[*]. Just one bite and the bright lemon flavor is sure to make these your new favorite muffins. The fresh lemon juice combined with almond flour, flax, and coconut flour rounds out this muffin recipe to perfection. Add 1-2 tablespoons poppy seeds to your batter for some extra flavor and crunch. Or add some room temperature unsalted butter to a warm muffin, right out of the oven. Preheat oven to 350°F and line a muffin tin (12) with nonstick spray or muffin cups. Add dry ingredients and lemon zest to a small bowl and whisk to combine. Add eggs, heavy cream, vanilla, and sweetener to a large bowl or stand mixer. Beat for 1 minute until light and fluffy. Slowly drizzle in melted butter and fresh lemon juice. With a mixer on low, begin to add dry ingredients to wet ingredients in small batches. Beat for 10-15 seconds. Let sit for 5 minutes. Stir in poppy seeds. Portion and divide batter into muffin pan. Remove Perfect Keto bar from wrapper and break into very small pieces. Crumble pieces onto tops of each muffin. Add chopped almonds. Bake for 18-20 minutes until golden brown on the edges and a toothpick comes out clean when poked through the center of each lemon muffin.